Our electrical team provides the full range of services required for any project, from specification through to implementation. Our fast, friendly and reliable service has gained us many long-standing clients, perhaps why they return to us over and over again for all their electrical service requirements. We are ECA registered and are constantly assessed, monitored and tested to make certain that our work is to the highest standard. 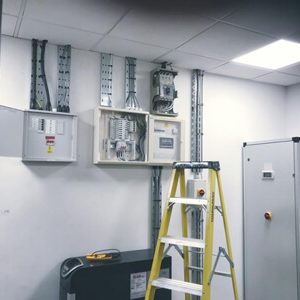 We are qualified to carry out installation and testing in domestic, commercial and industrial buildings; from offices, shops and commercial premises to warehouses and factories. Our domestic electrical services include working for homeowners and landlords. We offer a proactive maintenance service, repairs and PAT testing. We are also Safecontractor members and assessed to assure compliance with the latest Health & Safety regulations, so you can be sure that any electrical work we do for you is carried out, safely, legally and to government approved standards. Here at the Worldnetwork HQ we offer the full range of design and project services to produce detailed plans, specifications and drawings as required for you and the team. Our engineers hold ECS Electrician Gold Cards. We are a member of the Electrical Contractors Association (ECA) who regularly inspects our workmanship and processes.